Keenum helped the Vikings mount a double-digit second half comeback with accurate passing and strong play under pressure. When the 49ers rush affected play, he still managed to complete 4-of-6 passes for 60 yards and a touchdown, and did not take a sack. His passer rating of 138.9 under pressure is further evidence of his poise. Mostert was outstanding on Sunday night, as he totaled 130 yards from scrimmage while scoring once through the air and another on the ground. His aerial score was off a screen pass that saw him blaze past a number of Vikings defenders and break a tackle on his way to an 87-yard touchdown. He forced three missed tackles on just six total touches for a ridiculous 275.0 elusive rating. Hogan helped the Patriots forget about the injury to Julian Edelman (at least temporarily), as he shredded Detroit’s secondary for four catches, 70 yards and two scores. While Brady did throw an interception on a deep post to Hogan that looked like miscommunication, both of his scores went for 32 yards, showing he’s ready to pick up where he left off at the end of last season. Despite the interceptions, Brady saw a 118.8 passer rating when targeting Hogan. Jets quarterbacks earned a perfect 158.3 rating when throwing to Stewart this weekend, as the rookie caught all five targets thrown in his direction for 82 yards and two scores. While a poor run block limited his overall grade, his play through the air has to be encouraging for a young team struggling to find offensive weapons. Witten posted a strong 76.8 run blocking grade, and his 82.7 receiving grade was second-best among tight ends this week. He snagged all six passes thrown to him and turned them into 74 yards and a touchdown. Sambrailo earned a run-blocking grade of 85.4 this week, third-best among all tackles. While he did miss a stunt pickup, he was otherwise perfect in pass protection, not allowing a pressure on seven pass block snaps. Whitehair surrendered one QB hurry, but otherwise was excellent in pass protection. However, it was his 94.7 run-blocking grade that allowed him to post the top overall grade among guards this week. Wisniewski was perfect on 26 pass blocking reps, his first-such performance of the preseason, not allowing a single pressure on Eagles quarterbacks. His 78.8 run blocking grade was also his best effort of the preseason, signifying an apt readiness for the regular season. Feiler showed well on run blocks (80.3 run-blocking grade), and was even better in pass protection. The Colts failed to solve him in this capacity, as he did not yield a single pressure on 27 snaps on his way to the top pass-blocking grade of the week among guards (84.0). Hart posted the top overall grade and second-best run-blocking grade (85.5) among offensive tackles in week three. 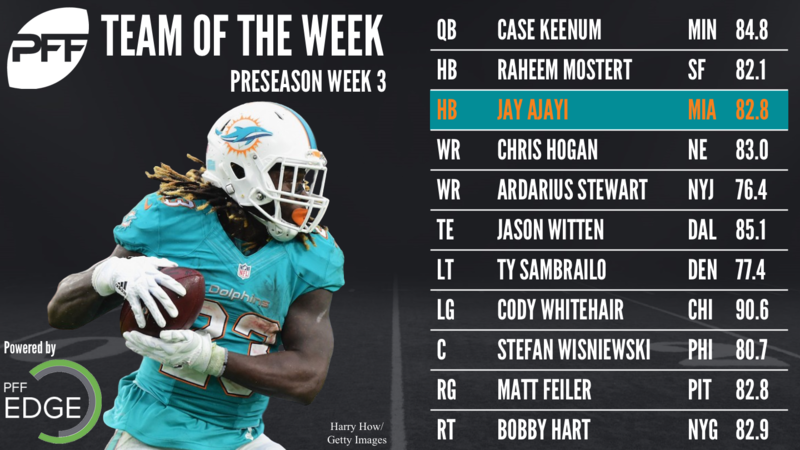 He did not surrender any pressures in pass protection, and has yet to do so this preseason on 49 pass-blocking reps.
Ajayi’s tough running and elusiveness was yet-again on display this week, as he racked up 53 yards on the ground on just nine runs and scored twice. He forced a total of six missed tackles, helping him to the third-best elusive rating during Week 3 of any running back with at least four touches, at 340.7. Harris’ overall grade of 93.8 was the highest of the week at any position, as was a dominant force against the Packers. Not only did he rack up three sacks and three hurries for a pass-rush productivity mark of 25.0 (tops among interior defenders), he also notched three run stops for a run stop percentage of 27.3. Not far behind Harris was Atlanta’s Crawford, as he managed three run stops of his own to go with a sack, a hit and a hurry. His run defense grade of 91.2 was 0.2 better than Harris’, giving him top honors for the week in the discipline. Preseason or not, Capi is having a breakout month for the Cardinals. He put forth his best effort this week against the Falcons, as he notched two sacks, two hits, two hurries for five total pressures and the week’s highest pass-rush productivity mark of 38.6 among all edge defenders. Jordan played his first 25 snaps of the preseason against the Texans this week, and looked to be in mid-season form. When rushing the passer he accumulated a hit and two hurries to go with a pass batted at the line of scrimmage, and he also notched two stops in run support. Brown posted the top linebacker grade of the week at 87.8, thanks in large part to his five solo tackles and four stops against the run. His run stop percentage of 22.2 was the best in the league this week among backers that played more than 10 run snaps. Burfict tallied three solo tackles and one run stop on Sunday afternoon’s game against Washington, but it was his pick-6 that earned him his spot on this week’s team of the week. Through three preseason games he has yet to give up a score through the air and opposing quarterbacks have a passer rating of just 41.7 when throwing into his coverage. Sanchez earned the highest cornerback grade of the week at 85.6, as he surrendered a passer rating against of just 2.8. He was targeted three times through the air, notching a pick and a break-up while giving up just one reception for seven yards. 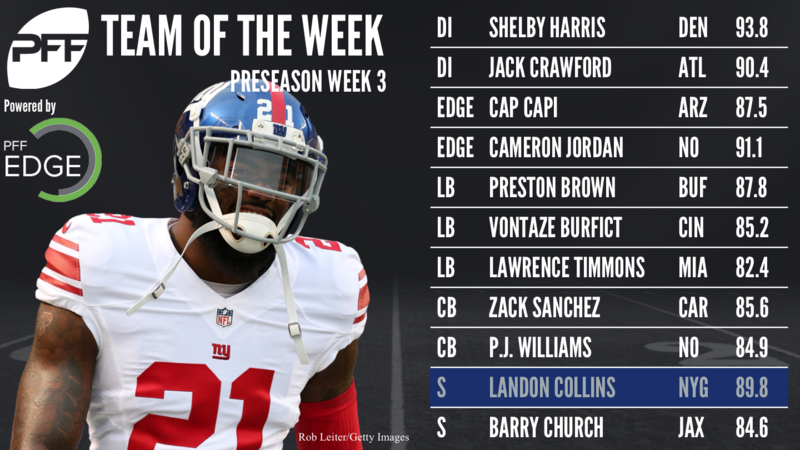 Williams is another player who has been excellent throughout preseason, and his game against the Texans this week was his best so far. He was targeted four times in coverage and gave up just one catch for a loss of one yard while breaking up two of the attempts. Thanks in part to that effort, Williams was the only cornerback this week to allow a negative amount of yards per snap in coverage, at -0.04. While Collins did miss a tackle in run support, he was outstanding against the pass, posting a coverage grade of 91.3. The Jets tested him five times, and he gave up just two receptions for six total yards an notched a pick. Collins wasn’t the only safety putting on a show this week, as Church was outstanding against the Panthers. He gave up just two receptions for two total yards on four throws into his coverage, and tallied six total defensive stops. Timmons did everything for the Dolphins this week, as he posted two total pressures and batted down a pass at the line of scrimmage when rushing the passer, and racked up four total stops. He also picked off a pass, as Eagles quarterbacks had a passer rating of just 45.8 when throwing into his coverage. Nugent nailed two field goals over 50 yards, and added two touchbacks as well. He is a perfect 5-for-5 this preseason for the Giants. When the Saints kicked off this weekend, Calhoun made it his business to get involved. Of the three kicks returned by the Texans, Calhoun was the primary tackler on two of them, and assisted on the third.